Forgery is a criminal act that takes place when a person falsifies something with the intent to deceive another person or entity. There are many kinds of forgery, but all are considered crimes in the United States. Forgery has a long history, but it became more common in the 20th century as technology has made it easier for criminals to commit the act. Some cases throughout history have been so remarkable that the forged pieces are in display in popular museums around the world. To explore this concept, consider the following forgery definition. Noun. The production of fake art or others works that a person claims are genuine fabricating. Noun. The act of devising, fabricating, or counterfeiting a document or other object. In order for the judicial system to charge a person with forgery, certain elements or factor must be in place. If one or more of the elements is missing, it can result in different charges. In order for the writing to fall under the definition of false, the material included must have been fabricated or altered significantly in order to represent something it is actually not. For example, if a person changes the will of another person to benefit himself, it is considered forgery. If a person inserts a false statement into a letter, but it does not change the meaning of the letter, it does not fall under the category of forgery. Simply falsifying a letter or document does not constitute forgery unless the person does so in attempt to defraud a person or entity. Under this element, simply possessing a forged document does not constitute forgery if the person with possession does not know that the document it false. For example, if you were to receive a check for a car you sold and the check was forged, you would not be held criminally liable unless you knew that the check had been falsified. If you knew that the check was forged, this constitutes fraud in many states. There is a wide range of documents that can be forged, but some are more common than others. Some of the most types of forgery involve signatures and prescriptions. Prescription forgery is a serious criminal offense and involves forging a doctor’s signature or the entire prescription in order to gain prescription medications, namely controlled substances. Since prescription forgery is becoming more and more common, some pharmacies contact the doctor that allegedly prescribed the medication before filling it. Art forgery consists of taking a piece of art and adding an artist’s name in order to pass it off as a genuine piece. A person can create the art piece themselves and add a false signature, or they can use an existing piece and add the signature. Art forgery can result in serious charges if the art is sold for a large amount of money. A person can also be subject to federal forgery charges if they mail, or carry a falsified writing across state, or international borders. The same is also true if a person has been found to commit forgery in multiple states. An affidavit of forgery is a legal document completed by a victim of fraud. Financial institutions and police departments often have the victims fill out the form and have it notarized. The affidavit of forgery acts as a sworn oath that the documents in question has been falsified. The form is used during the civil or criminal court proceedings. The affidavit of forgery is also used to help victims recover losses that occurred as a result of the forgery crime. For example, if a person notices that some is using their checkbook and forging their signature, they can fill out an affidavit in order to regain the money taken from their account. Some states rely most on the type of document in question specify forgery punishment according to the severity of the forgery crime. For example, in New York, different degrees of forgery are in place depending on the document used during the crime. When a person has been charged with forgery, they should consider hiring a criminal defense attorney as soon as possible. An attorney with experience in dealing with forgery can help the person understand forgery laws in the state, go over the evidence that the prosecuting attorney has, and help explain the options available. An attorney can also help a person charge protect his rights before, during, and after the court proceeding have taken place. While hiring a lawyer can result in high costs, it is important to consider the benefits as facing the judicial system alone can be daunting and detrimental. Forgery occurs within the United States on a daily basis, but some forgery cases have made national headlines to their severity. Some of the most famous cases of forgery involves art. In the 1960s, David Stein made a living traveling from city to city, selling paintings that he claimed were done by European masters. Since the artists’ signatures were in place, many people fell for the scam. In 1967, one of these artists, Marc Chagall, saw three paintings in a New York City gallery containing his name. He knew these were not his works and he contacted the police. Stein was arrested and spend 22 years in jail. Unfortunately, shortly after his release, he was back to selling fake works of art. In 1970, a reclusive tycoon named Howard Hughes was the victim of forgery. Due to his isolated lifestyle, he was an easy target for Clifford Irving. Irving, an ordinary man, contacts publishing companies claiming that he had a letter signed by Hughes giving him permission to write his biography. McGraw-Hill, a famous publishing company paid Irving $765,000 to write the book. Irving boldly began writing it, believe that Hughes would never find out since he suffered from a metal disease, and never left his home. Irving was in for a shock two years later, however, as Hughes held a conference letting the world know that he did not know Irving and never gave him permission to write his biography. Irving was arrested and spent 17 months in prison. Defendant – a person or entity accused of a crime, or an entity that is being taken to court in a civil case. 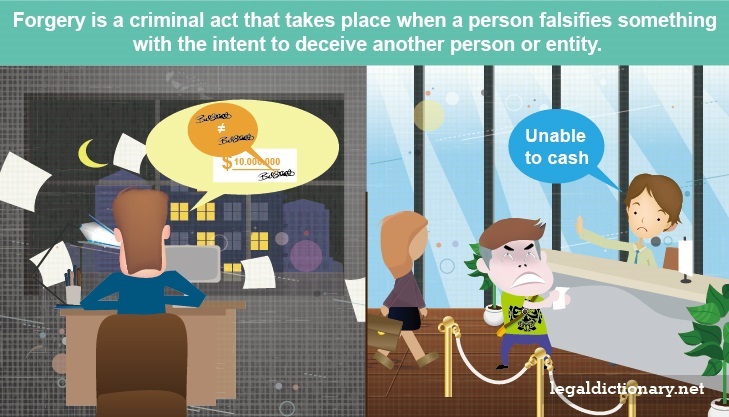 Defraud – legally obtaining money or assets from a person by using deceptive measures. Entity – a company or organization as a whole. Notarized – a document or letter that has been witnessed and signed by a notary making it a legal document. A Schedule was Posted on the sheet on the board. I sign by it. Later to find out the Schedule had been changed by my Name to another Schedule I didn’t Sign for. Is this Forgery? Youth sports organization requires 2 signatures on checks. Authorized signer permitted a non authorized person to sign their name. Is this legal? If u put your husbands credit card number as a back up just in case and he canceeld the card around june but they are still charging his new card without your knowlege and he does an affidivt on it can i go to jail ?